Why do babies cry? There are so many responses to that question. So many I’ve heard are along the lines of….babies need to cry to exercise their lungs, it doesn’t mean they’re hungry/sad/need anything, sometimes they cry for no reason. Babies just cry. I’m disappointed whenever I hear these type of comments. 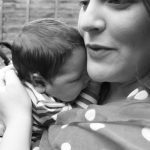 As a Speech and Language Therapist, I have learned a lot about human communication as it develops from baby through to adulthood. Crying is the earliest form of communication that new parents will usually hear from their baby. I have often wondered why this isn’t the obvious response that is given about why babies cry. So why do some “experts” advocate ignoring their cries? It’s because they don’t seem to believe that crying IS communicating. It’s actually the main way they can communicate, but there is a lot of behaviour that we can tune into before the crying starts. If we respond to them when they display signals of hunger, tiredness etc. early enough they don’t even have to cry. And as anyone with babies knows how hard it is to feed a crying baby or get an upset baby to sleep, it makes sense to read their behaviour before they begin to cry and get really upset. The process of attachment is what really helps us when babies cry. When we keep them close and pay attention until we learn how to read their little cues, we can often meet their needs even before they cry. This process of attachment is the process by which we attune to our babies, and they attune to us. In other words, it is about bonding and creating an intimate relationship. This process of attachment, is a lasting attachment that affects relationships within families for years and years to come. So it really is pretty important stuff. I am currently enjoying reading about the power of the sense of touch in attachment and creating lasting attachments within families. It is truly fascinating. I firmly believe that creating secure attachments will have a lasting effect on the impact the next generation will have on our society. So what’s the bottom line? Babies will cry, but that is a major part of their communication, and we as parents are the ones often close enough to listen and respond. We can tune into them by watching and listening to them as they experience life with us. We do this in order to determine what their n eeds are, but it is essentially the most important part of creating a healthy attachment to our babies with lasting effects. So let’s keep our babies close, listen, watch and become fascinated by the attachment process as we learn about who these little people are who make just as great an impact on our lives as we do on theirs.